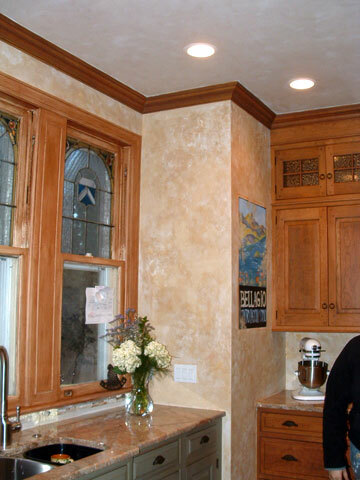 Founded by Lillian R. Beretta in 2002, Lillian’s Paintbrush is a decorative painting company that is dedicated to pleasing their customers and creating beautiful and varied paint finishes. Lillian turned her passion for painting into a full time business in 2002. Her first projects inspired further study with Michael Lane of Philadelphia, followed by continued studies with the Finishing School of New York, Faux Effects International and Modello Design. Realizing that the industry continues to grow she carries on her studies with various certification courses allowing her and her crew to remain on the cutting edge of new processes and continuing to develop as Certified Decorative Painters. The one woman operation of 2002 has become a team of highly dependable workers. Our team understands the importance of working quickly, efficiently, and in the cleanest way possible. We take care of our client’s valuables and “details” are important to us. Our courteous office staff ensures a wonderful experience from the moment you call; all questions and concerns are answered in a timely manner. We believe that communication, hard work, and careful planning lead to a rewarding experience and a beautiful project. We are pleased to collaborate with our clients, their designers and/or contractors. Lillian’s Paintbrush is registered with the State of NJ 13VH03537700. We travel throughout the state and the shore. We are also licensed to work in the City Of Philadelphia 447539 and travel to many Pennsylvania locations. We also travel to Delaware and will consider traveling to other states, just ask. We are a fully insured company and are happy to provide a copy of our certificate of liability insurance if necessary.